I have a relatively new pair of NNN cross-country ski boots and noticed the plastic sole is much more slippery than previous boots I've owned (older SNS and SNS Profil). A quick look at the selection in a store showed me most models have this feature/drawback. I occasionally have to walk not ski wearing these boots, so I'm looking for a creative solution to deal with this--and I'm guessing others have dealt with and hopefully solved the problem already. I assume sanding the soles wouldn't help, as the plastic is already relatively rough. 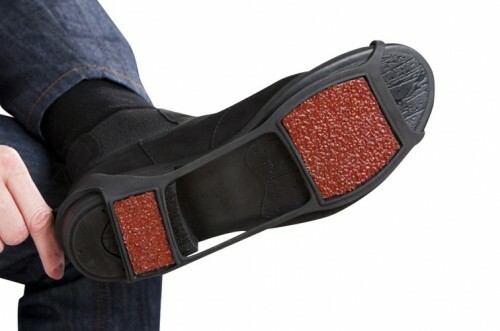 Or perhaps I could slip something over the boot when I need to walk with it, like a rubber? Or perhaps there are new models of boots that don't have slippery soles. Back-country NNN/SNS boots look quite sturdy, maybe they have better soles (I know that would require new bindings, but I'm open to that too)? Or will the soles get less slippery with time? I did find one skier's solution here, which involves rubbers with spikes. But this wouldn't work in my case, I want to use them in places like public buses (which I know from experience are slippery when wearing x-country boots, especially when the driver is in a hurry and you haven't sat down yet). Put rubbers/galoshas (or any other huge size boots) on your ski boots. Remove the soles of your previous ski boots (or any other of your old boots with good grip) and glue them to a spare pair of NNN bindings. Click off your skis, click on your anti slip soles. Use the method of rubbers with spikes, but skip spikes. Again, you can use a part of your old boots for this. They solve the problem of slippery soles (though the basic model leaves the heel uncovered), but they do wear out fairly quickly (already showed significant wear after one season of use). Not the answer you're looking for? Browse other questions tagged gear boots cross-country-skiing or ask your own question. Vibram FiveFingers or Non-Hiking Boots as a Beginner in Hiking?